Hi all! It’s my favorite time of year: Christmas! One of my favorite parts of Christmas is watching the Hallmark channel constantly. 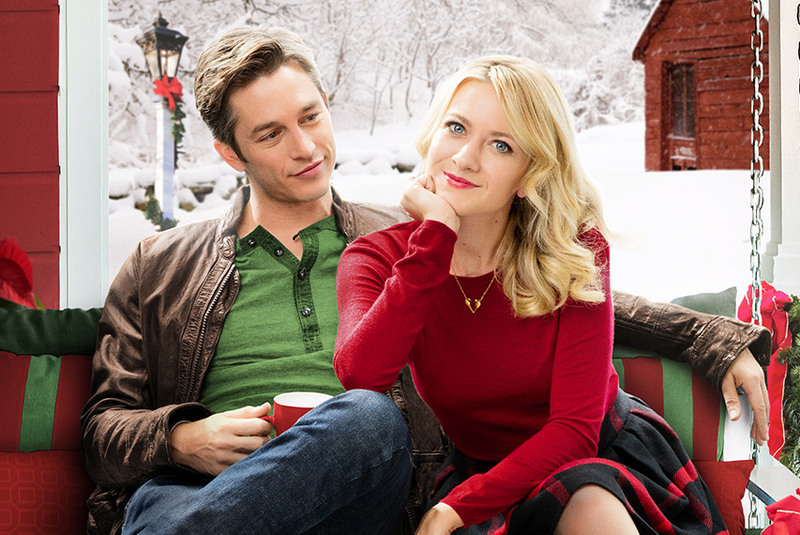 I know, I know, they’re super cheesy and predictable, but nothing puts me in the Christmas spirit like watching a city girl fall in love with a small town guy in a town called something like “Candy Cane.” I thought I’d share three of my favorite Hallmark channel Christmas movies that you might want to watch, too! In this movie, Jessie (Arielle Kebbel) has sworn off relationships after leaving her third fiance. Attempting to leave her past behind her, Jessie plans to point her focus toward the interior design business she owns with her sister, Vivian. On the other hand, Aiden (Andrew Walker) has recently set up a bet with his friends, challenging himself to find a fiance by Christmas, which is only four weeks away! When Jessie and Aiden cross paths at an art gallery, Aiden figures out the victim of his bet. This movie is so adorable! This movie just makes you smile, but also yell at the screen when sad events happen to the character. For once, actually, I was slightly surprised by the way the movie ended up, which was a nice change of pace. Although, the best part of this movie might have been Jessie’s family, her mom, dad, and sister had some comedic bits that made me giggle, which is probably more than I have ever laughed–minus the times in which I laugh at something that isn’t supposed to be funny–at any Hallmark movie. With these funny characters involved, the film was so enjoyable! Cynthia (Meredith Hagner), a hopeless romantic, is left dumped right before she is supposed to go home for both Christmas and her younger sister’s wedding. Determined not to be single at the wedding, Cynthia brings along Liam (Bobby Campo), the illustrator of her children’s books. Upon their arrival, gifts begin arriving at her father’s house. Each day, a gift coinciding with one of the Twelve Days of Christmas arrive, beginning with a Partridge in a pear tree. Cynthia is convinced the gifts are for her, and is determined to solve this, in her own words, Christery! While this movie is absolutely annoying at some moments, it’s one of the Hallmark movies I always find myself coming back to because it is just so fun and cheery (it also involves a wedding which is always a plus for me)! These characters were lovable and relatable but also really interesting; some of them seemed to have more layers than your typical Hallmark character. The joy of Christmas really shines in this movie, and it would be perfect to watch whenever you’re a little stressed and need to be reminded of the happiness of the holidays! In “A Royal Christmas,” Emily Taylor (Lacey Chabert), a tailor from Philadelphia, learns that her boyfriend of about a year, Leo James (Stephen Hagan) is actually Prince Leopold of Cordinia. Now, Emily must go with Leo to spend Christmas in Cordinia with his mother, Queen Isadora, who disapproves of her son marrying a “commoner.” As Emily spends the holidays away from home, she must prove herself worthy of royalty and the queen’s son. Is it possible for a Hallmark movie to be bad when Lacey Chabert is in it? As of right now, I’m pretty sure that answer is no. As many have said, Lacey truly is the queen of Hallmark, and if you have no idea who she is (which is likely), she actually played Gretchen in Mean Girls. This movie is just another feather in Lacey’s Hallmark hat. The setting and the drama mixed with how absolutely adorable Emily and Leo were as a couple made this movie truly a stand-out in the universe of TV holiday films. This is definitely one to put on your DVR each holiday season! During December, I love to just snuggle up on the couch in a blanket and watch movies like these, and I hope you find these movies great to watch, too! Since I couldn’t include all of my favorites, here are a few more fantastic Hallmark movies! Feel free to click here if you’d like to see all the new Hallmark movies of the 2018 season! This puts me in the mood to just drop everything I’m doing and watch Christmas movies until New Years. I’m glad you enjoyed it! I know that I wish I could just stay in a blanket, drink hot chocolate, and watch Christmas movies during this season too! Thanks for stopping by and hope to see you here again soon! I loved this post! Watching cheesy Christmas movies is also one of my favorite past times during the holiday season. Your reviews on the movies were great and made me want to watch all of them. I’m definitely taking a day off from homework this week to snuggle up in a blanket and get to binge-watching. I’m so glad that you liked it so much! I hope you definitely check one out! Thanks for stopping by!